If you like working in the kitchen and preparing meals, or someone you love does, you have likely considered buying a food mixer. These are handy tools that nowadays can handle any job required in a kitchen. With a plethora of brands and models, how do you decide which one is the best one? There are at least 3 main points to consider when buying food mixers. The first point of consideration is – What are you going to use it for? This question requires a lot of thought not just about the present, but also the future. Some food mixers are quite an investment with the price. So, you must ensure you cover your bases well. If you just need one for simple things like making sauces and cake mixes, you may be fine with a small one. But, in time you may adapt to having one in the house. Maybe cooking projects would increase in complexity and size. It is worthwhile looking at what’s available and then what you could envision yourself doing. Many have the option to add parts to them at later stages. If you are unsure of what you want to do, then you could opt for that kind of model. Power is an important thing to take into account when thinking of the uses of a food mixer. The higher the wattage the more speed and strength your mixer will have. Lots of decent models have an adjustable power dial, this is handy if you are using it for a variety of things. Bread mixing, which is quite sticky and heavy, tend to need a much faster 1000 Watts of power. Whereas, cakes require around 800 Watts to get the mixing done fast and effective. Hygeine should be the next thing to bare in mind. You want a kitchen mixer that is very easy to clean. Why? Think about the reasons you bought it – to make things quicker and easier. If you can’t take it apart and clean the whole thing easily, it’s not really any quicker. 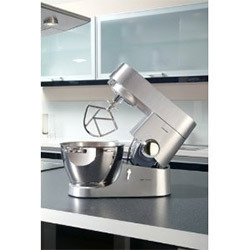 A food mixer is a convenience tool, find a model that can be that for you. The third important criteria for a good food mixer is the design. Don’t be fooled by anyone that tells you they are all essentially the same. They really aren’t. This applies mainly to if you are buying a standing mixer, and not a handheld variation. You need to make sure that the base is fairly wide and that the mixer isn’t too high. This will help the robustness and reliability of the mixer. A tall mixer with a slim base will eventually cause problems and could be a danger. That is the main tips for buying a kitchen food mixer. As with regards to budget, it’s always a good idea to spend as much as you are able to on things like food mixers. If you buy a decent one, you might be handing it down to your children, who might hand it down to theirs. They can be a proper investment.